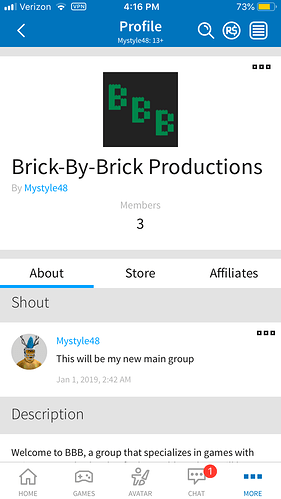 New Group Details Page is Live! I also noticed that sometimes (actually most of the time for me), the group games (on the group page) isn’t showing the actual players. For example, the group page says there’s 0 players but there is actually 15 players ingame. I’m not sure if it’s my resolution causing the issue, I have the entire page zoomed out (CTRL+MouseWheel) because it seems too big for me. Yep, and the games change their order randomly. The new layout is great! I like the changes and it certainly feels more modernized and cleaner. Although I have one suggestion. On the group page where the members are listed, could we get back the ability to type what page of members we want to see? I found that old feature helpful in determining if a group has all legitimate players or if they’d just been botted. Yeah, I noticed that happen aswell. However; I don’t think it’s exactly random. I think it’s more like based off the player count. From highest number of players to lowest number of players, look at mightybaseplate’s reply and you’ll see what I’m talking about. Some games doesn’t disappear when I set a game to private. The updated group page was definitely needed and I like how this one is, but there’s a few things that could really be worked on. The one thing is all the empty space that was left laying around. Was this on purpose for other things to fill later? It ruins the flow of how the new layout looks, honestly. The redundant “social links” also confuses me too, why are they found in two different places that aren’t even that far apart from each other? Also, if you’re a rank with a long title, it should honestly text wrap instead of being cut off with “…” like the old page was. Other than these things, the group page looks great. 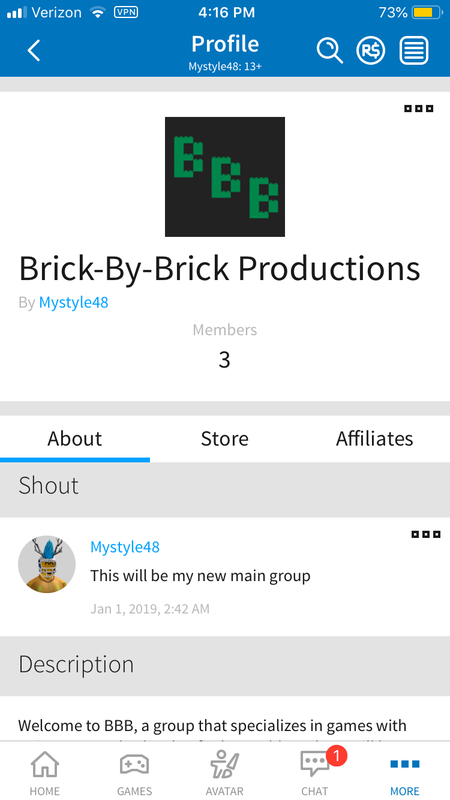 I see group admin is planned to be updated in the future, which is far overdue and hopefully will look way nicer than the old one. I hope Roblox starts turning around all the other outdated pages, they’re off to a good start. Looks very good. Group Admin page should be updated as soon as possible too. They’re most likely working on updating those pages next. Sometimes, the order of games changes for me which is really strange. I don’t think either have been 100% resolved for me yet. Not really a fan, I feel as if it is trying to do too much. Either way though if it’s what a majority wants than by all means go for it. When is the “Not all group games are being displayed” issue being fixed? I was told it was going to be fixed really soon but it’s still not fixed. I’m personally being affected by this, as users think some of my games are closed, due to them not being on Top Searches (another issue roblox has at the moment, where it in certain cases puts clickbait games on the top searches instead of the actual original and most played ones) or being listed in the group. We are still investigating the root cause. 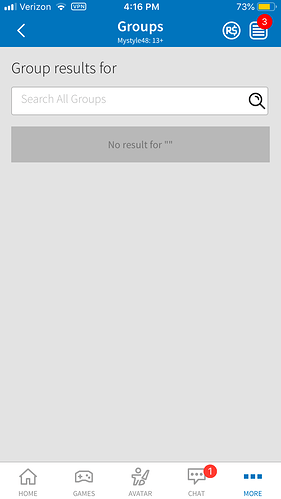 For some reason I’m unable to access groups in the mobile app. I’m not able to interact with any groups, and the groups tab is showing empty search results instead of displaying the groups I’m in. I noticed this yesterday. When activating a group game, it takes a while for the game to appear in the “Games” section. This was a problem for me aswell, As I had made a game I published it and activated it, I had to wait about 20 minutes before it was up on the site. ROBLOX, I think older one was better for me atleast. I’m noticing a lot of issues revolving around the game section of this update so let me enlighten everyone on my experience with this. As far as I know the games are being displayed by how many people are playing. (Which I strongly disagree with and I would like to CHOOSE HOW I PLACE MY GAMES. Another issue i’m noticing is the player count in the game is incorrect always. The counter that I see on the games section is different from the game page and that is different from the live developer stats. I have also noticed this problem occur on mobile. I have tried to log out and back on to see if it resolved this problem/ bug but it has not.